This month Applied Words looks at how women are represented in film, music, television and other popular media and what lasting effects these portrayals leave on young, female identifying individuals. 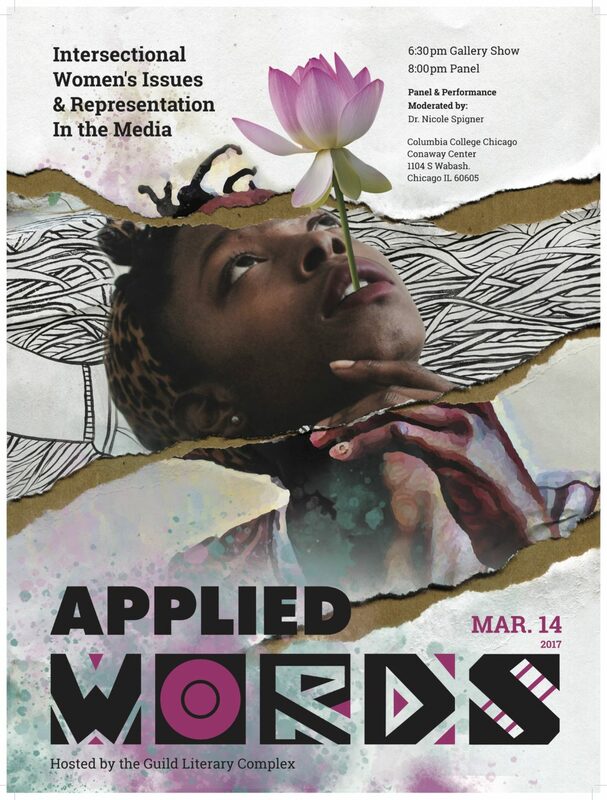 Dr. Nicole Spigner, Associate Professor of African American Literature and Culture at Columbia College Chicago, will lead a discussion with artists working to reimagine the narrative of women in the media. Nicole A. Spigner is an Assistant Professor of African American Literature and Culture in the English Department at Columbia College Chicago. She completed her Ph.D. at Vanderbilt University and M.A. and B.A. degrees at University of Pennsylvania. A scholar of the nineteenth-century, her book project, Niobe Repeating, explores how, through Ovidian allusions, themes, and forms, nineteenth-century African American women writers redefined literary convention, gender configurations, and racial identity through their “Black New Women” classicist fiction. Dr. Spigner also engages with and teaches classes featuring black feminist and feminist theories, nineteenth-century American literature, and twentieth-century African American and Caribbean literatures. Jane Rhodes is trained as a mass media historian with specialization in African American history and culture. She focuses on the study of race, gender and mass media; the history of the black press; media and social movements; and African American women’s history. She is particularly interested in how aggrieved communities have used print culture, film, electronic media, music, and other expressive cultures as modes of resistance and empowerment. Her work also explores the gender politics of African American communities and the experiences of transnational black subjects . Rhodes’ first book Mary Ann Shadd Cary: The Black Press and Protest in the Nineteenth Century (Indiana University Press, 1998), was named the best book in mass communication history by the Association for Education in Journalism and Mass Communication. Her second book, Framing the Black Panthers: The Spectacular Rise of a Black Power Icon (The New Press) was published in Fall 2007. Rhodes was featured in the award-winning documentary The Black Press: Soldiers Without Swords (California Newsreel, 1999). Most recently she was the Joy Foundation Fellow at the Radcliffe Institute for Advanced Study, and a visiting fellow at the Center for the Study of Arts, Humanities, and Social Sciences at the University of Cambridge (U.K.)., both in 2012-13. A current research project continues Rhodes’ long-standing interest in how African Americans use media to carve out spaces for political, intellectual and cultural exchange. Rebel Media: Adventures in the History of the Black Public Sphere presents critical essays on black American media from the 1920s to the present. Rhodes is also researching a biography of a black American expatriate and psychoanalyst tentatively titled Transatlantic Blackness in the Era of Jim Crow: The Life of Marie Battle Singer. Stef Skills is a mother, artist, and educator living and working in Chicago. She has participated, organized, and curated mural productions and art shows for over the past 20 years. Betty Heredia is a visual artist, born & raised in Chicago. She displays her drawings and paintings at various venues across the city. Betty is also founder of No Checks Accepted Gallery & Community Space, where she curated a group art show, This Way, with members of the Awkward Rebels Collective. Betty Heredia continues her art practice and teaching in Chicago. Her illustrations have been published in New City, Linework Comics Anthology and Corpus Corpus. Oona Holtane is an artist who specializes in illustration and design. Her work focuses on portraiture and character design through working with digital medias. Much of her art captures a subject’s essence with the use of color and emotive expressions. Oona is currently studying at Northern Illinois University to complete her BFA in illustration. Kush Thompson is a political-romantic poet, author of A Church Beneath the Bulldozer (New School Poetics, 2014) womanist, painter, avid As Told By Ginger watcher, teaching artist, and chapter co-chair of Black Youth Project 100 Chicago. Voted runner-up best local poet of 2014 by The Chicago Reader and one of The Root’s 2015 Young Futurists, her work has appeared in Poetry Magazine and The BreakBeat Poets: New American Poetry in the Age of Hip-Hop. Ellen Ma is a rising name in the Chicago streetwear and graphic design industry doing work and paid collaborations with such brands as Leaders 1354, Zumiez, and Hebru Brantley, as well as doing graphic design work for Grammy award winning artist and Chicago native, Chance the Rapper. The term ABC – American Born Chinese – describes children of immigrants who grew up in America. At a young age, her heavily academic family ingrained focus and work ethic that fueled her artistic pursuits. Ellen also has a painting career on the side, having hosted several art shows. Ellen’s body of work is a blend of graphics, pop surrealism, and vibrant contemporary colors. She combines her graphic design with traditional approaches often blending the two in her experimentation. Ellen has been formally trained at The School of the Art Institute of Chicago with a focus in visual communications and painting. She is expected to graduate this spring.